The heatwave is well and truly established and I have just one course left before a summer break. It’s been busy since my last newsletter with lots going on, the highlights of which I’ll share below. These include the ongoing favourites (continuous arm, Classic double bow and rocking chair) and also my two new chairs, the ‘low back’ and ‘Full-English double bow’. More details of these new chairs are given below, but I should point out that the ‘Full-English’ is reserved for returning students only, due to the large amount of work involved! I thought it might be useful to give details of vacancies for my courses over the rest of the year, in case you are planning to come and make a chair! If you’d like to book a course, please drop me an email to check that the place is still available and then let me have a deposit of £275 to secure the booking. I hate making the same old chairs again and again, with no variety, so I’m always trying to come up with new designs. 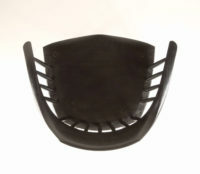 Also, it gives serial-chairmakers something new to get their teeth into! Inevitably, some are a great success and others are not so popular, but I think that these two chairs will stand the test of time. The two chairs could not be more different. The low-back is totally new and is based around some very serious steam bending, while the Full-English is completely traditional. The first course for this chair will be January 21-25. Please email me if you are interested. My first comment should be to reassure you that it does not have to be black! I painted this chair to hide an unsatisfactory wood-colour combination and quickly to get it to a show! The next version will be in natural wood. 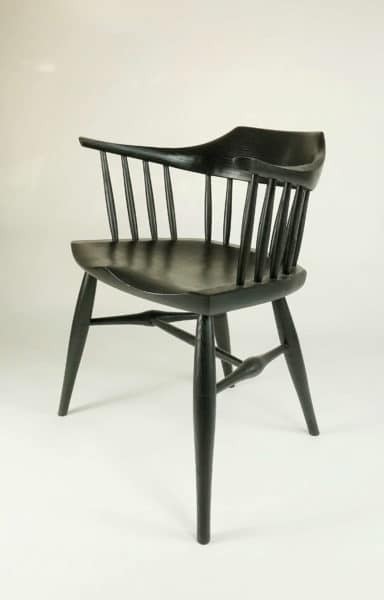 Low back chairs, often known as Captain’s chairs or Smoker’s Bows, are almost always made with a ‘sawn-arm’ as opposed to a steam bent arm. The traditional arm is made of 3 pieces (two arms and a crest) which are screwed together and shaped. To achieve good comfort, the crest needs to be quite deep to support the back as the spindles play no part. This new chair is quite compact and is the most comfortable chair that I have ever made. It’s not just my opinion, as the response at two recent shows that I have taken it to, has been almost universally positive! 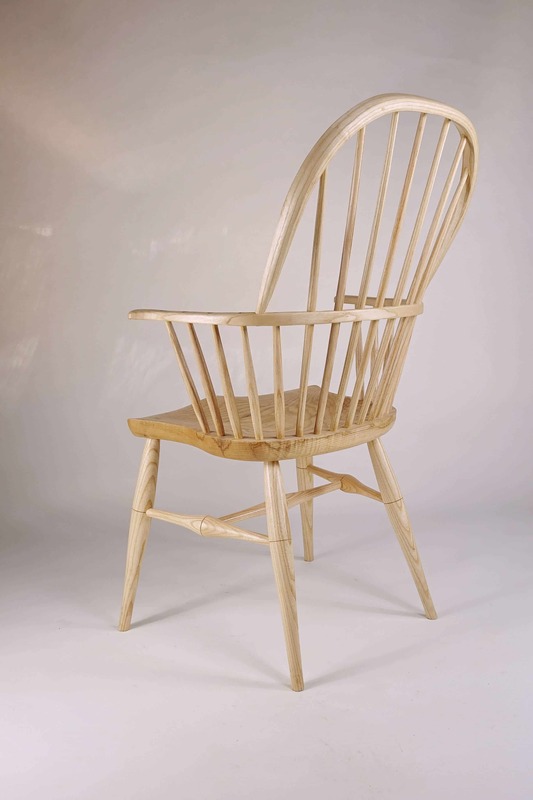 The arm/crest is made from a single piece of steam bent ash which measures 1 ¼” x 5” x 48” before shaping. The chair is of a deliberately modern design and is quite compact (w 22″ x h 27.5″ x d 19″). 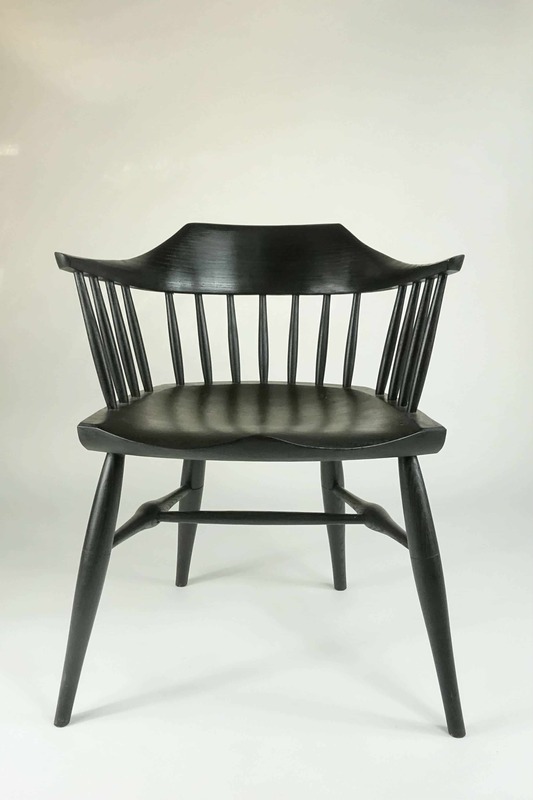 There are many traditional influences in the chair, perhaps the most obvious being the four parallel spindles under each arm, which are part of the Welsh Windsor tradition. The bending was quite a challenge. I built a new bending rig with a 1 tonne, double-geared winch and some heavy duty cables. I was helped by my friend Roger Smith for the first bending session and it was quite a workout. Have a look at the video (posted on Instagram) of one of the bends. I am now contemplating buying an electric winch! Watch this video to see the arm of the low back chair being bent. The ash was 5″ x 1.25″ x 48″ and spent 90 minutes in the steam before bending. The first course for this chair will be March 18-22. Please email me if you are interested. First, I should explain the name! 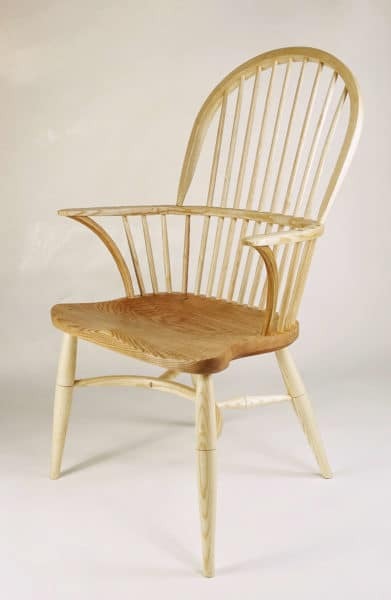 I have called it ‘Full-English’ as it has almost all the features that a traditional English chair can contain, apart from perhaps a splat and cabriole legs. It will be a challenge, like a Full-English breakfast, to make on a 5-day course! At first glance it may appear very similar to the Classic double bow. However, closer inspection will reveal a totally different chair. Primarily, it is a bigger chair all round. It has a crinoline stretcher, curved armposts and 9 as opposed to the Classic’s 7 long spindles. 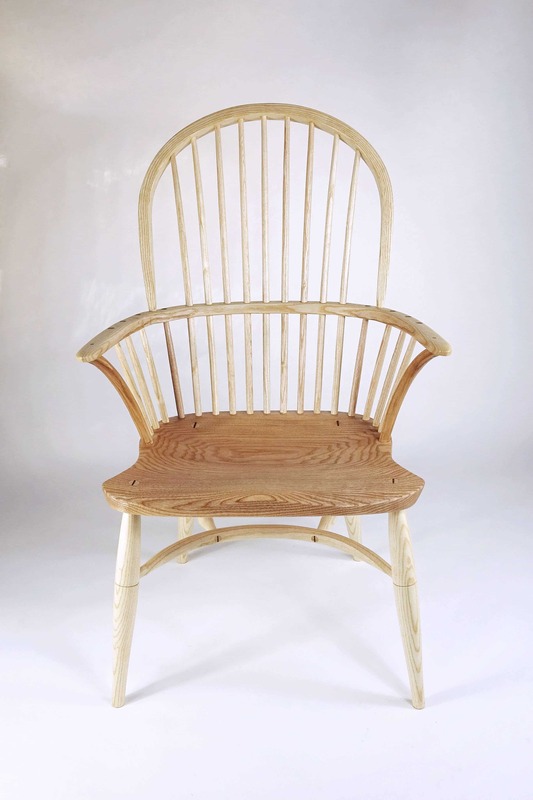 I am reserving the chair for those that have already made a chair at The Windsor Workshop. 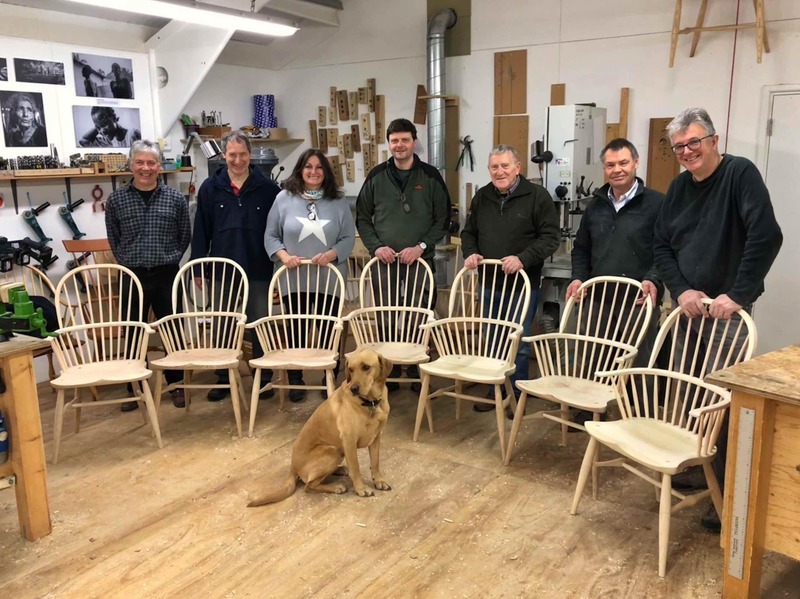 This is due to the amount of work involved and the need to squeeze a lot of chairmaking into 5 days. 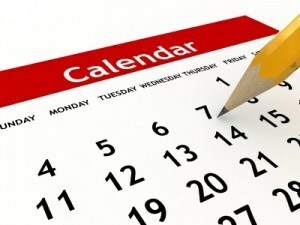 I have three more shows scheduled for the rest of the year. Each show is quite unique and it would be a pleasure to see you if you are in the area. I have not attended this show for at least 10 years, opting instead for Pashley Manor at the end of the month, but it will be great to return to this lovely location. 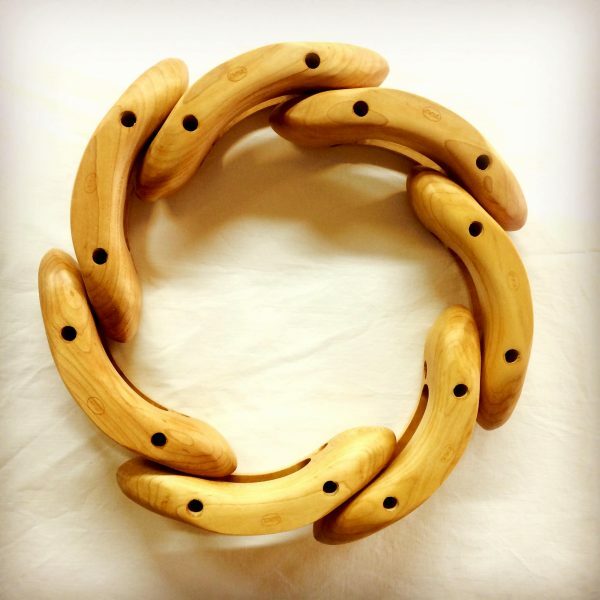 The show is 3 days long and a feature of it is that most makers will be demonstrating their craft in some way. I plan to take some spokeshaves and travishers to shape some seats. The organisers are the same as for the wonderful May Bank Holiday show at RHS Wisley. I have not done this show before, but it will take me to a new area and I’m confident that it will be worthwhile. 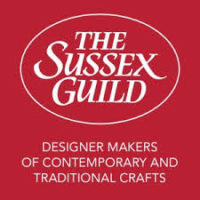 I am a little biased about this show as I am one of the organisers, but it is the Guild’s largest show, in a great location and timed perfectly for the run up to Christmas! Nearer the time, I should have free tickets for this show that you can download from the website and a newsletter. Do please put the dates of these shows in your diary. It would be great to see you and you would have an excellent day out at any/all of them! Hopefully, you will have by now forgotten about the constant stream of emails from suppliers about GDPR. If you receive this newsletter via email, it means that you indicated your wish to continue on my mailing list. The response was most gratifying – thank very much for continuing to take an interest! We have had builders on site for 6 months now! All the drainage work that I mentioned in my last newsletter and which caused such an upheaval is now a distant memory. The larger of our two holiday-let units is close to completion and work is under way on the second. My wife, Louise, and I are thrilled with the way ‘The Stables’ has worked out. There’s a mezzanine bedroom with views all the way to the South Downs and downstairs there’s a fully equipped kitchen and bathroom, along with a lovely living area which will contain a double sofa bed. It will be luxury for one, perfect for a couple and also suitable for a family! This video will give you some idea of what we have been up to, and how it will look. Full details, at least of The Stables, will be given in my next newsletter…….. If you are coming on a course in the autumn, or next year, I hope you will give serious thought to staying on site! Not wishing to let the grass grow under my feet, I have been giving my travishers serious attention recently. I have no details for you yet and this is just a teaser to let you know that new versions will become available in the next few months! The travisher has remained unchanged for about 8 years and proved remarkably popular and I am excited by the upcoming developments………..! 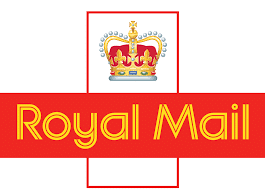 I took a travisher, addressed to Illinois, USA, to the Post Office at 10.55 am Thursday 21 June and received an email from the customer, timed at 11 pm Monday 25th June, thanking me for such a speedy service.